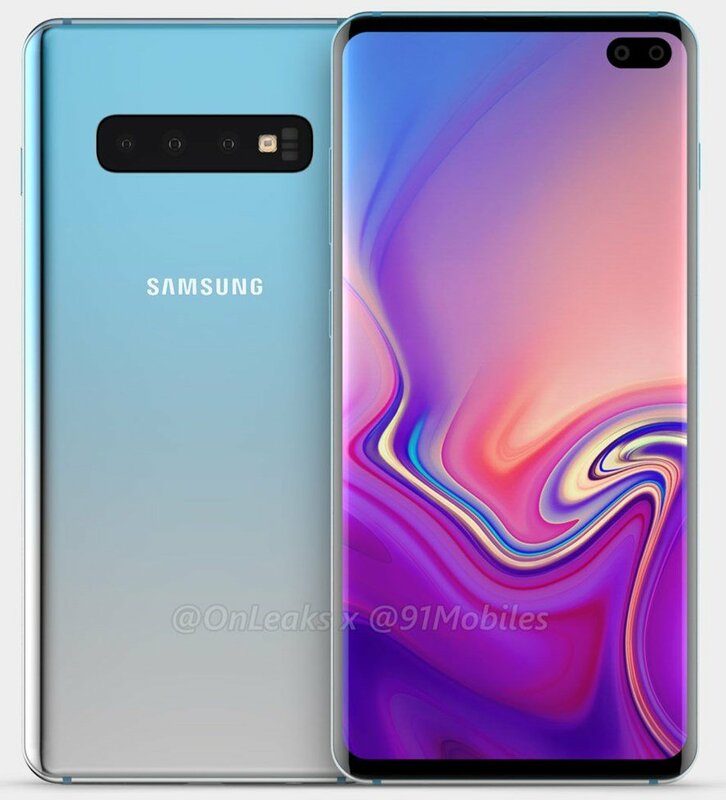 [Update]: It appears that the Samsung Galaxy S10 unofficial leaked renders were of a prototype and @Onleaks have just updated them with new renders which reveal four rear cameras aligned horizontally instead of three. Apart from the number of cameras, the new render also reveals that the shape of the flash & sensors are slightly different and the bezels around the display also appear to be slimmer on the new renders. 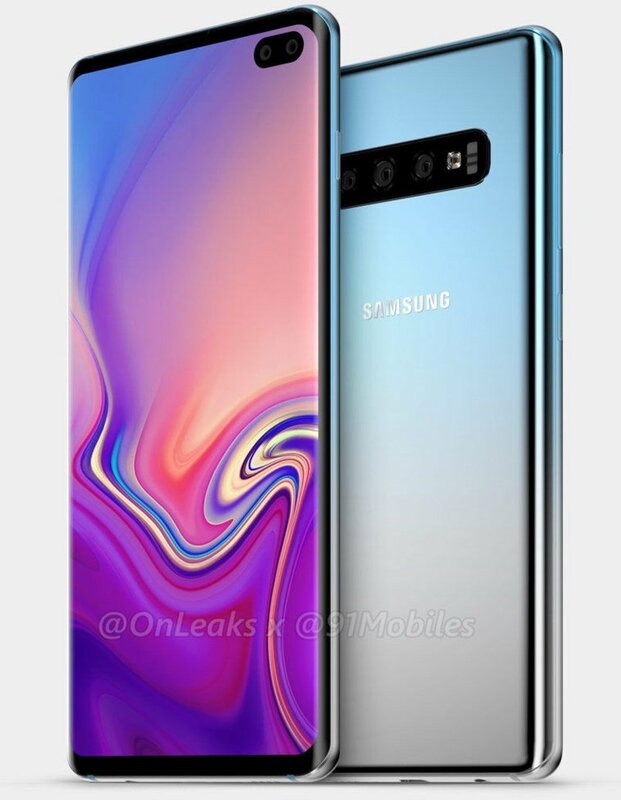 With this new update, we should preferably wait for some more leaks before we can be sure of the design of the Galaxy S10. A set of Galaxy S10 Plus unofficial renders have been leaked online, and they show a drastic design change from the Galaxy S9 Plus. Here’s what the upcoming flagship reportedly looks like. According to the report by 91Mobiles, the Galaxy S10 Plus is equipped with a 6.4-inch QHD+ AMOLED display. And we know from prior leaks, that Samsung will incorporate an in-display fingerprint scanner. This will be an ultrasonic sensor, which should be faster and more accurate than the optical sensors used on devices like the OnePlus 6T. These leaked Galaxy S10 Plus unofficial renders suggest that the phone will feature in-display selfie cameras. There are dual lenses in the on-screen notch, which is placed in the top right corner of the display. This is a questionable move, especially considering that Samsung demoed a set of Infinity display models recently, including a punch-hole in-display selfie camera design which looked much better. The Galaxy S10 Plus will sport 3 rear cameras, which could be a standard cameras, a telephoto camera and a wide-angle camera, along with an LED Flash. The Galaxy S10 Plus will run on Samsung’s new One UI based on Android 9 Pie. The renders do show a 3.5mm headphone jack, but word on reddit is that the device may ditch the audio port. The phone is expected to be a powered by a Qualcomm Snapdragon 8150 (in the US), while the rest of the world will get the device with Samsung’s own Exynos 9820 processor. In terms of storage the phone could come in 64GB/128GB variants with 6GB/8GB of RAM, though some rumours have hinted at an overkill 1TB of storage and 12GB of RAM. The design seen in these Galaxy S10 Plus unofficial renders, if true, is not good. There is a forehead and a chin bezel, and the selfie camera placement is quite terrible. Though the bezels are slimmer than the previous generation, Galaxy S9, there are still bezels. In today’s world, Samsung has to compete with the likes of devices which have full screen displays and nearly-full screen displays which have a waterdrop notch, that offer a lot more screen to body ratio.